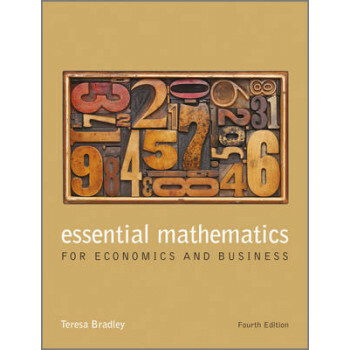 Essential Mathematics for Economics and Business is established as one of the leading introductory textbooks on mathematics for students of business and economics. Combining a user-friendly approach to mathematics with practical applications to the subjects, the text provides students with a clear and comprehensible guide to mathematics. The fundamental mathematical concepts are explained in a simple and accessible style, using a wide selection of worked examples, progress exercises and real-world applications. New to this Edition: fully updated text with revised worked examples and updated material on Excel and Powerpoint; new exercises in mathematics and its applications to give further clarity and practice opportunities; and, fully updated online material including animations and a new test bank. The fourth edition is supported by a companion website, which contains: animations of selected worked examples providing students with a new way of understanding the problems; access to the Maple T.A. test bank, which features over 500 algorithmic questions; and, further learning material, applications, exercises and solutions. Problems in context studies, which present the mathematics in a business or economics framework. It includes updated PowerPoint slides, Excel problems and solutions.